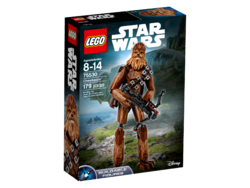 75530 Chewbacca is a Star Wars buildable figure set released in 2017. Add a big Wookiee to your LEGO® Star Wars collection with this buildable and highly posable Chewbacca figure. Standing over 11” (30cm) tall, Chewbacca features ‘fur’ decoration, a detailed head, removable ammo belt and bag, and a bowcaster weapon with spring-loaded shooter and extra ammo. Young Wookiee warriors will love playing out heroic battles against iconic enemy characters. 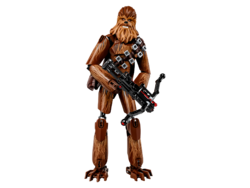 Buildable and highly posable Chewbacca figure features ‘fur’ decoration, detailed head design, removable ammo belt and bag, and a bowcaster weapon with spring-loaded shooter. Blast the enemy with the powerful spring-loaded shooter. Play out epic adventures from the Star Wars universe. Stands over 11” (30cm) high. This page was last edited on 9 February 2019, at 22:19.